I used to design things. Custom rugs mostly. Also mirrors, lamps, plates, furniture, and even scarves. The years spent in the high end home furnishings market trained my eye and taught me much about the detail and discipline required to develop design strong enough to translate through the many phases of development from sketch to final manufactured product. But now I paint. My designer eye responds to line, form, and certainly color. I look for the color and structure hiding beneath the surface of things. I push the world I see into an abstracted, but recognizable play of color, texture and geometry - a fresh, fun, modern take on the classic genre of landscape painting. I plan a little, play a lot, listen to music and let my instincts lead the way - this is about joy! As much fun as it is to loosen up and play with paint, the designer in me is alive and well. I’m attracted to clean composition, color, pattern and texture. After years of the controlled specification required for production of custom rugs and other home furnishings products, I enjoy the immediacy of paint on my brush, color at my finger tips, the smell, the feel, and the constant surprises that lead the way. Painting, for me, is a rewarding form of down and dirty magic. 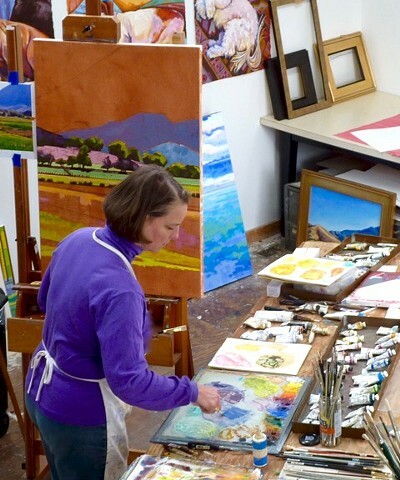 Born and bred in Richmond Virginia, in 2008 I re-located to mid-coast Maine where I painted, cooked, wrote, ate and enjoyed the fabulous scenery. As of May 2014, I’m back in Virginia in my new hometown of Lexington, right in the middle of the beautiful Shenandoah Valley; a big change from coastal Maine, but every bit as inspiring. So here I am, still at it, painting these gorgeous, layered fields and old blue mountains. Life is good.